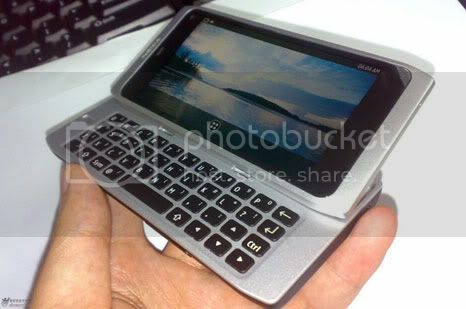 Nokia could be about to launch the Nokia N9 smart phone. An authentic-looking video has appeared online which shows a phone very similar to that we speculated over last week. The sleek, shimmery video doesn't do anything useful like give the phone a name, except to say it's part of the N series, so it could conceivably be the N950. Precise details are thin on the ground. The video is more about sexing up the handset and splashing water about (like that's a good thing to do next to your new phone). A few taps of the pause button reveal several tidbits, however. The phone has a 12-megapixel camera with a Carl Zeiss lens and an LED flash, matching the N8's best feature. As previously suggested, it does seem to be running MeeGo, though there are also Symbian-like elements visible. Early reports suggested the N9 would contain a 1.2GHz Intel Atom processor (like this crazy Fujitsu handset), which would fit with last year's rumours, though it may pack in a Qualcomm chip instead. Screen resolution and other features are still up for grabs. We'd expect them to at least match the N8. That means a 3.5-inch touch screen at 360x640-pixel resolution, the usual sensors, Wi-Fi, Bluetooth and HDMI output. Although the video is bound to contain simulated shots, the handset may well be close to readiness. After all, we've been looking at it for nearly nine months and it must've been fairly complete in order to pass FCC tests. Regardless of Nokia's comings and goings with Microsoft, surely it's time to give birth to this phone.